After having the overview over the main processes (step 1) we will have a look into the IT landscape. The main task is to identify gaps, redundancies or missing interfaces in the IT landscape. To get a clear picture about this we use the method of modeling a process application map (model type IT landscape). The context for this model are processes (step 1), Users (or organizational units) and IT applications. All on a more or less high level. 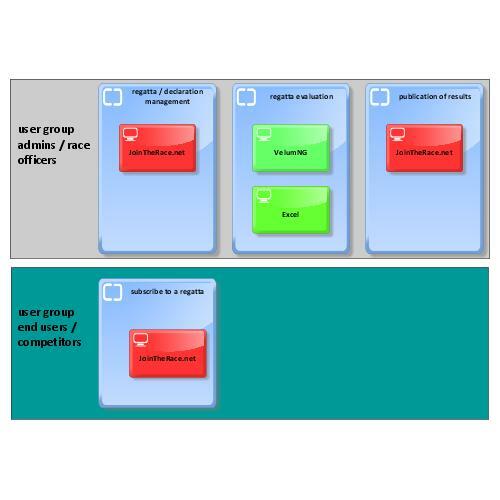 We can also identify that there is a gap (marked red) in the process support: the both processes regatta / declaration management and publication of results are not supported. This is a gap the application jointherace.net is placed. You can see it red marked in the model. Conclusion - what do we have after step 2? ... and this is quite a lot! !